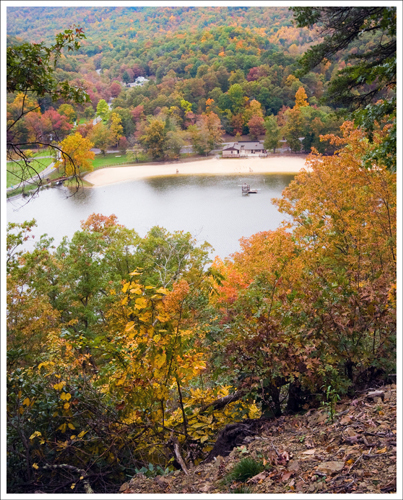 Molly’s Knob is the best known hike in Hungry Mother State Park. On a clear day, views of Mount Rogers can be seen from the summit. 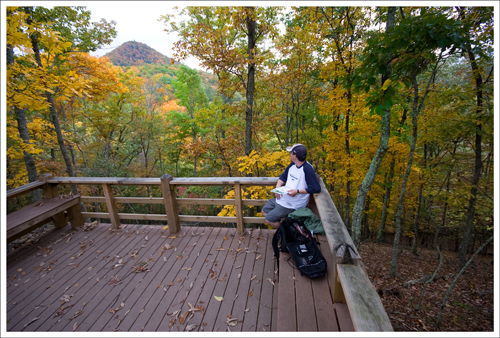 Adam takes a look at Molly’s Knob from the viewing platform lower on the trail. On our way down to Abingdon for a weekend of hiking and biking in the Highlands, we decided to stop by Hungry Mother State Park. There is an interesting legend surrounding the origin of the park’s name. Native Americans destroyed many settlements south of this park on the New River. Molly Marley and her child survived the raid and were taken captive. Eventually they escaped the raiders. They wandered through the wilderness until Molly finally collapsed. Her child wandered away, hungry and alone. Eventually the child was found by residents of a small settlement near where the park stands today. All the child would say was “Hungry Mother”. A search party went out to find Molly, but they were too late. There are some variations to this legend, but it is an interesting tale. The colors of the fall leaves were really quite gorgeous in the park, so we decided walk around a bit. Of course, the hiking enthusiasts that we are, we decided to try the hike up Molly’s Knob. We parked in a small lot on the northeast side of Hungry Mother Lake. We left the car and began walking the Lake Trail Loop, giving us glimpses of the beauty of the lake. After .5 miles, this joined the blue-blazed Ridge Trail. We continued on this up a steady uphill grade for .2 miles until we reached the viewing platform pictured below. With the beautiful colors on the mountain of Molly’s Knob in view, we decided to take the remaining trip to the summit. We continued up the white-blazed Molly’s Knob Trail for .9 miles. The trail was marked as a black diamond trail, but we didn’t find this portion to be too difficult. After the .9 miles, we began the fuchsia-blazed Vista Trail. This was the steepest portion of the hike, but once we got to the top, we were quite impressed by the view. While I scurried around looking for a geocache, Christine enjoyed taking a few pictures of the views. We shortened the trip back by just following the Molly’s Knob Trail to our car. We were worried about the hike taking too much out of us for our trip to Mount Rogers the next day, but it was worth the risk to see these views. The forest was filled with foliage of every color. Pictured Below: The golden foliage along this trail was especially spectacular. Adam even found several geocaches along the way. Going on this hike was completely unintentional. 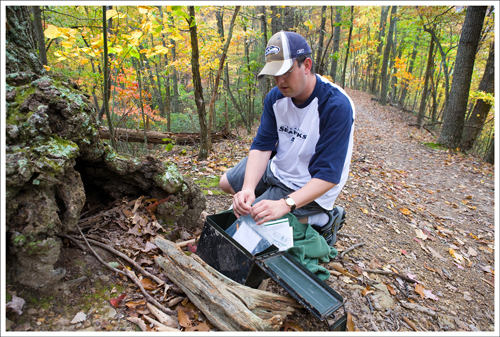 We wanted to drive through Hungry Mother State Park just to see what the park had to offer. But the foliage along the lake was so pretty, that we felt compelled to get out of the car and walk a bit. I thought a short stroll along the level Lake Trail would be pleasant and scenic. After a short bit of walking, we reached the junction of the Ridge Trail, and decided to turn there to make a short 1 mile loop back to the car. At the top of the ridge, we saw the platform overlooking Molly’s Knob off in the distance. Next to the platform, a sign indicated that the summit was only 1.3 miles further. The short distance made the summit far too tempting, and we were on our way. I kind of regretted not changing clothes before we hiked. The impromptu nature of this hike had me wearing jeans, a dressy shirt and my hair was down. About halfway up the steep climb, I would have traded just about anything for a ponytail holder. As luck would have it, someone left a pack of hair elastics in one of the geocache boxes Adam found. I was much more comfortable with my hair up, but hiking in jeans is never fun. 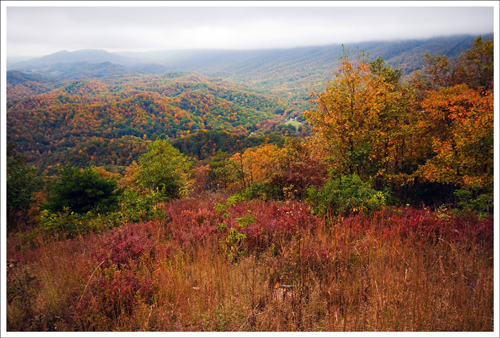 The view from the top was obscured by fog and clouds, but it was still beautiful with all the fall color. Pictured Below: You get some nice views of the lake along the trail. 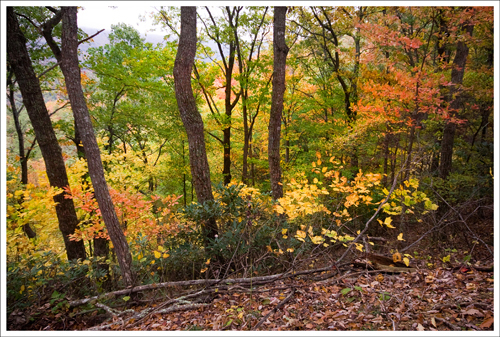 There were some steep sections of trail, but the fall colors were so beautiful I hardly noticed the climb. We had almost the entire trail to ourselves, too. We saw just two other solo hikers near the beginning of the hike, but after that we didn’t encounter a single soul. The wind was rustling through the treetops, sending colored leaves falling down all around us. Plumes of fog curled around the folds of the mountains. Off in the distance, we could hear a pileated woodpecker cackling. In no time, we reached the summit and its beautiful view of the valley. There were two benches built into the summit, so it was a perfect place to rest before hiking back down. The trail down was so steep in some places, that momentum had us practically running downhill. The final stretch back gave us a very pretty view of the lake and the beach below. This hike turned out to be a great surprise! Difficulty – 3. The steepest parts were the Ridge Trail portion and the Vista Trail, but we found it to be a moderate hike. Trail Conditions – 4 The trail is well-maintained and traveled. We found the Vista Trail to be a little slippery during the rain due to some clay surface. Views –3.5. Great views from the summit and Hungry Mother Lake. On a clear day, you should be able to see Mount Rogers. Waterfalls/streams –2. You do get some nice views of the lake. Since it used to be a stream before it was dammed, we thought it was worth mentioning. Wildlife – 1. We saw a pileated woodpecker, but nothing else. There is some good birding in the area. Ease to Navigate – 4. There are a few switches in trails during the path we chose, but everything was well-marked. Solitude – 4. We only saw two people on the trail on a Saturday afternoon, so I’m guessing it is not very well-traveled. During heavy camping weekends, I would expect more traffic. On I-81, take exit 47 and then take 11 South. After a little over a mile, take a right on to 16. 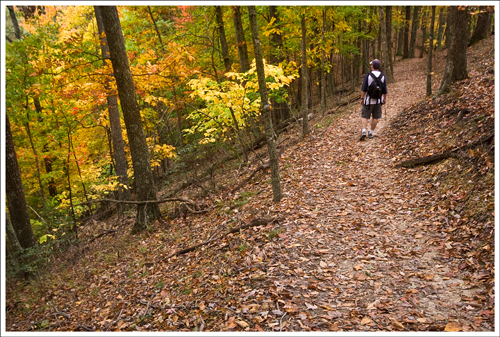 Follow this into Hungry Mother State Park (fee required of $2-$3). Take a right immediately after the P6 lot and continue on the road until you reach a cul-de-sac parking lot. The sign for the Lake Trail Loop is at the end of the cul-de-sac. That fuchsia trail is a huffer! Loved the fog and clouds and beatuful fall foliage. It was fun reading this as it is all your entries. Thanks again for taking the time to share! Thanks for the visit! You should head down to that area sometime. It has so much to offer to folks who love the outdoors.